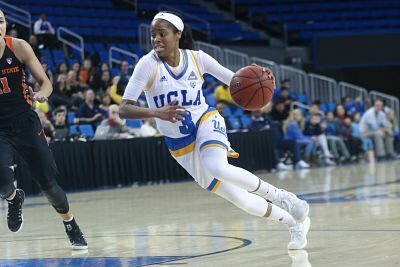 Jordin Canada’s speed up the court helped her lead UCLA against OSU with 18 points. Photo by Marvin Jimenez. Los Angeles, Calif. – A strong fourth quarter by the No. 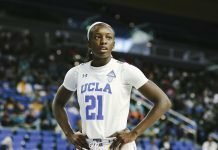 17 UCLA Bruins propelled them past the No. 10 Oregon State Beavers Friday, 66-56. 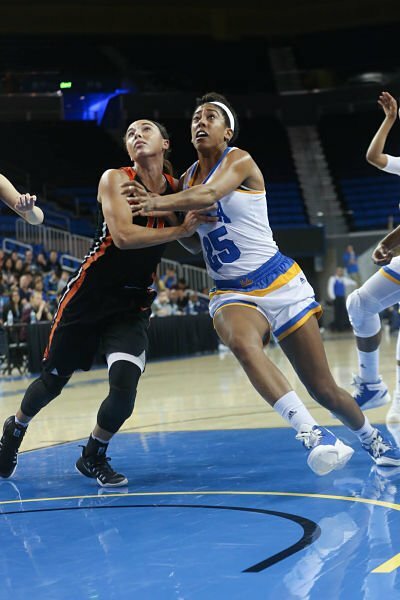 Jordin Canada led UCLA with 18 points and 10 rebounds in an emphatic bounce back from last weekend, when the team lost both Pac 12 games on the road. 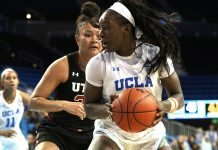 Monique Billings added 17 points and Kennedy Burke, 10 in the 21st consecutive home win for the Bruins. The Beavers, who upset Stanford on their home court for the first time five days earlier, saw their 12-game winning streak snapped. Gabby Hanson led three players in double figures with 13 points. The first two quarters were back-and-forth affairs, with 12 lead changes, four ties, and neither team garnering more than a six-point lead before halftime. 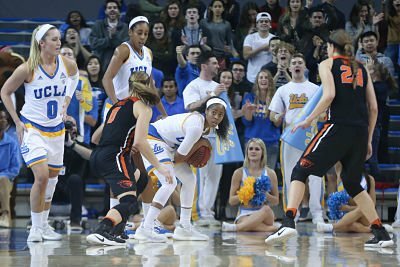 Oregon State began the third quarter on a 9-0 run, holding UCLA scoreless for the first four minutes to build a 39-32 lead. Nicole Kornet scored a three-pointer at the buzzer to cut the visitor’s lead to 46-41 at the end of the period. Oregon State’s Gabby Hanson and UCLA’s Monique Billings battle for a rebound. Photo by Marvin Jimenez. The Bruins turned it up in the fourth quarter and went on an 18-8 run to take a 59-54 lead at the 3:38 mark. Both teams held each other scoreless until Kornet free throw with 38 seconds remaining. Free throw shots by Canada, Burke and Kornet down the stretch sealed the win for UCLA. Besides coming off consecutive losses, the win was big for the Bruins because of their fourth quarter performance. This season they have averaged less points in the last period than in the first three game quarters, but they outscored Oregon State 25-10 in the fourth Friday night. UCLA coach Cori Close said the maturity of star juniors Canada and Billings set the tone for the team. “I loved the perseverance and leadership that Jordin and Mo had, when they didn’t have a great start – they just really stayed the course, executed the game plan and let it come to them,” Close said. It was the first conference loss for the Beavers. Coach Scott Rueck credited the Bruins for their game-ending momentum. Jordin Canada protects the ball while looking to pass. Photo by Marvin Jimenez. When Rueck took the reins at Oregon State in 2010, he had two players on the roster. Last season, he guided the team to the Final Four. This year the Beavers started slowly, but have been climbing in the rankings. Rueck said numbers don’t mean much to him. 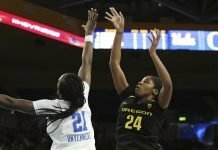 Oregon State takes on USC Sunday, while UCLA hosts Oregon.